Lobster Mac & Cheese is arriving on fine-dining menus across the nation. Now it can effortlessly arrive on your dining room table. In a matter of minutes, our indulgent seafood and pasta dish goes from your freezer to your oven and onto your dinnerware, without an ounce of effort. Once you sit down to enjoy it, you'll find a hearty base of cooked cavatappi pasta. Atop that perfect al dente spiral pasta, we pour a special four-cheese sauce made with Parmesan, Swiss, Gruyere, and Gouda. Finally, we add large chunks of wild American lobster - specifically chosen for its light, sweet taste that's a perfect companion to the rich cheese sauce. And just for good measure, we sprinkle panko breadcrumbs to add a pleasant crunch. 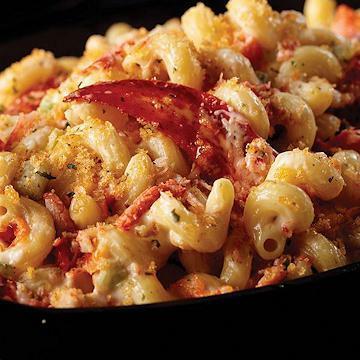 With our Lobster Mac & Cheese, you'll look like you spent hours in the kitchen, when it only took minutes. And you can rest assured that you're only plating the best in seafood, because our lobster is sustainably sourced from the waters of the Atlantic. Makes a perfect appetizer, snack, or unique gift - order yours today! KEEP FROZEN: COOK THOROUGHLY: Appliances vary, adjust cook time accordingly. FOR FOOD SAFETY AND QUALITY, FOLLOW THESE COOKING INSTRUCTIONS. FOOD MUST BE COOKED TO INTERNAL TEMPERATURE OF 165�F AS INDICATED BY A FOOD THERMOMETER. Oven: Preheat oven to 425�F conventional/400�F convection. Remove Lobster Mac and Cheese from plastic wrap. Cover with foil and place on baking sheet. Bake for 55 minutes covered. Uncover and bake for an additional 15 minutes. If additional browning is desired, broil for 2-3 minutes. Ingredients: CAVATAPPI PASTA (WATER, ENRICHED DURUM SEMOLINA [WHEAT FLOUR, NIACIN, FERROUS SULFATE, THIAMINE MONONITRATE, RIBOFLAVIN, FOLIC ACID]), MILK, LOBSTER (LOBSTER MEAT, SALT), PARMESAN CHEESE (MILK, SALT, STARTER CULTURE, ENZYMES [LIPASE, MICROBIAL RENNET]), SWISS CHEESE (PASTEURIZED MILK, CHEESE CULTURES, ENZYMES, SALT), GRUYERE CHEESE (PASTEURIZED COW'S MILK, SALT, CHEESE CULTURE, MICROBIAL RENNET, CALCIUM CHLORIDE), PANKO (UNBLEACHED WHEAT FLOUR, SUGAR, SALT, YEAST, ASCORBIC ACID), GOUDA (CULTURE PASTEURIZED MILK, ENZYMES, ANNATTO [COLOR]), CARROTS, CELERY, SHALLOTS, ENRICHED FLOUR (WHEAT FLOUR, MALTED BARLEY FLOUR, NIACIN, REDUCED IRON, THIAMINE MONONITRATE, RIBOFLAVIN, FOLIC ACID), GARLIC, HALF & HALF (MILK, CREAM), BUTTER (PASTEURIZED CREAM), EXPELLER PRESSED CANOLA OIL, SALT, PAPRIKA, GARLIC POWDER, SEASONING (SALT, DEHYDRATED GARLIC AND ONION, SPICES, DEXTROSE, NATURAL FLAVOR, DEHYDRATED BELL PEPPER, DEHYDRATED ORANGE PEEL, SUGAR, CITRIC ACID, EXTRACTIVES OF PAPRIKA, WITH NOT MORE THAN 2% CALCIUM SILICATE [ADDED AS AN ANTICAKING AGENT]), TARRAGON, PARSLEY, CHILI PEPPER, WHITE PEPPER, NUTMEG, CAYENNE PEPPER. CONTAINS: MILK, SHELLFISH (LOBSTER), WHEAT.